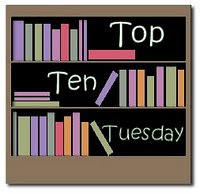 The Broke and the Bookish : Fictional Crushes: Jen's Top Ten Tuesday List! Oskar from Extremely Loud and Incredibly Close: If I was eight years old I would be in LOVE with Oskar. We'd definitely get married on the playground during recess. Wes from The Truth About Forever : Sa-woon! He's the artistic one, I want him to make me my own sculpture out of stuff he finds at the junkyard. Gale from the Hunger Games Trilogy: He's strong, dependable, he cares for his family, and not afraid to stand up for what he believes in. Marcus from Sloppy Firsts (the Jessica Darling series): I haven't finished the series yet but I have a soft spot for Marcus. I loved his day of the week t-shirts and cryptic messages to Jessica. Roger from Amy & Roger's Epic Detour : Who wouldn't want a cute boy to take a cross-country road trip with? If you cry in front of Roger he's not going to freak out on you, he'll give you his sunglasses to wear so people can't tell you've been crying. Plus, he makes amazing mix CDs. Dexter from This Lullaby : Be careful, when you first meet Dexter he might accidentally knock you off your feet (literally). But he's passionate about music, funny (his band has a song about potatoes), he loves his dog, and he never gives up. Shay from Nightshade : Okay, so I haven't even read this book yet (it comes out today!) but I loved the marketing campaign for Nightshade. I loved how you could interact with Shay online and read his blog and watch videos he posted. He seems like a good guy (plus, he's kind of cute!). Shay's Facebook. Ethan from Something Blue : I read this book last year so I don't remember much about why I liked Ethan but he is incredibly patient (somehow he managed to put up with Darcy), and he currently lives in England. Sam from Shiver (Wolves of Mercy Falls) : I haven't read Linger yet so my opinion could change but so far I love Sam. He loves reading (even worked in a bookstore one summer) and comes up with little songs about Grace. Edward from The Twilight Saga: Don't hate! I know most people over the age of 16 hate him. But when I read Twilight I liked how how he acted chivalrous and like a gentleman. I had a lot of fun making this list! Now spill, who are your fictional crushes? I can't wait to read everyone's list! Next week's topic: In the spirit of Halloween, Tahleen will be sharing her top ten scariest books! Oooh, excellent choices! Marcus is definitely my fictional character "crush to end all crushes," and he just gets hotter as McCafferty's series progresses! I love Gale and Ethan, too, and Oskar is brilliant. So glad I'm not the only adult who broke down and added Edward! I must read some Sarah Dessen! I considered adding Sam from Shiver, too, but decided against it at the last moment. Good list. Some of your picks have definitely made my 'lust' list when reading the book but they just haven't stood the test of time. I really must read some Sarah Dessen also! I also have Edward on my list. Haha. I guess he can be considered a guilty pleasure! Sorry I haven't read most of the books on your list. I won't hate on Edward. He definitely has a knight in shining armour (or skin) quality. Plus, he is awefully dreamy. It's my first time participating in your Top Ten Tuesday. It was a hard question but I managed! Everyone seems to be Edward fans; I'm going to have to go against the majority on this one and say Jacob! Po from Graceling. No one else even comes close! Don't worry... Edward would be on my list too!!! I'm not sure if I'm going to participate in this weeks list.. I'm not sure if I have enough fictional crushes! We'll see though!! Great list! I'm totally with you on Oskar. He made me laugh out loud so many times, especially when he told that older lady, "I think we should kiss." I have a lot of your crushes on my TBR pile haha! I really need to start reading faster! I rarely do memes but I just couldn't resist this one. Thanks for hosting. I really liked Edward at first, but the 3rd and 4th book in the series were a bit of a turn off. Gale was my favourite of the series first, but then I started liking Peeta better and now neither of them made my list somehow. I was in love with Edward when I read Twilight. He was just such a gentleman. And then he became a weirdo creeper. lol He made my list though. I realized I don't read many books with swoon-worthy babes in them. Wes! I almost forgot about Wes! Yes, he's a definite runner-up for me. I loooved answering this question. I completely forgot about Marcus from the McCafferty series! Loved this week's Top 10! Fantastic list! I agree about Wes, Dexter, Sam, and Edward. Awesome! I'm not familiar with most of those! I agree with Gale, but not with Edward. Ew. Stalker. I did a similar post like this a while ago. I may have to revisit it and see if anything has changed. Can't say I've heard of most of these choices, but the Hunger Games & Edward from Twilight seem to be popular for this week's top 10 meme. Here's my Top 10. Cheers! Aw, Roger sounds cute! I've heard some good things about that book, I should really read it! Great post! Egad though..I've only had first hand reading experience with the last choice...Edward! Oh, and no worries on the "don't hate"...me? Um, yeah...I'm definitely over 16 and can I just say...TEAM EDWARD RULES! *ahem* ^_^ I'd probably add on to this list....Patch from Hush Hush ("bad boy" choice) and Julian from THE FORBIDDEN GAME series. Happy reading! NOT EASY. I came up with four (two of which are from TV) and a long discourse on why it wasn't easy. FAIL. This one was really hard. I have so many fictional crushes it is kind of pathetic but I got it down to 9 there were too many others to pick a number 10. I can't agree more with Gale. I just started the Hunger Games Trilogy, so I don't think I got to know him that well as a character, but from Katniss's eyes he is completely amazing. *sigh* Sam would've been eleventh on my list. Too bad we can't do the top 20. What a fun list! I haven't read any of these, though Roger and Amy's Epic Detour is on my shelf - I meant to read it during our road trip this summer but didn't get to it. Now you've given me extra incentive. Certainly no hatin' coming from me...Edward made my list too :):) This is the funnest meme!!! First time visiting and on the TTT. Im a Edward fan of course :). Im a new follower. Most of your choices I have yet to read the books except for Edward of course. I went the wolfy way on that. Also Sam probably would made it close on my list. he just seems to have to boyish quality to him. Anyway loved the list question. Chose this topic today even if it's done already, I love it !! Love the weekly Top 10 Tuesdays!! Gilbert Blythe, Anne of Green Gables; if he were real my heart would stop in a second. He'd make such a good boyfriend! I will put 'Twilight Saga' as my favorite one. ALL OF THE MALE LEADS OF MELINA MARCHETTA BOOKS.